My research interests are in the areas of communication theory, optical networks, resource allocation problems, and array processing. Recent research activities have focused on optical network designs based on existing infrastructure networks and communications for disaster management. P. Saengudomlert and M. Médard, “Guaranteeing the BER in transparent optical networks using OOK signaling,” IEEE Journal on Selected Areas in Communication, vol. 20, no. 4, pp. 786-799, May 2002. P. Saengudomlert and V.W.S. Chan, “Hybrid optical and electronic signal processing for ultra-wideband RF antenna arrays,” Proceedings of IEEE ICC 2005, South Korea, 16-20 May 2005. P. Saengudomlert, E.H. Modiano, and R.G. Gallager, “Dynamic wavelength assignment for WDM all-optical tree networks,” IEEE/ACM Transactions on Networking, vol. 13, no. 4, pp. 895-905, August 2005. P. Saengudomlert, K.M. Ahmed, and R.M.A.P. Rajatheva, “MAC protocol for contacts from survivors in disaster areas using multi-hop wireless transmissions,” Proceedings of Asian Internet Engineering Conference (AINTEC) 2005, Thailand, 13-15 December 2005; also appearing in Lecture Notes in Computer Science, no. 3837, pp. 46-56, 2005. G.T. 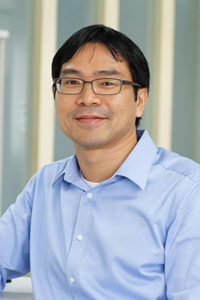 Nguyen, A.B. Sharma, and P. Saengudomlert, “Optimization of the core-router fiber-delay-line-buffer dimensions for Horizon-based optical burst-switching in WDM networks,” Proceedings of International Conference on Optical Communications and Networks (ICOCN) 2005, Thailand, 14-16 December 2005. L.W. Chen, P. Saengudomlert, and E.H. Modiano, “Uniform versus non-uniform band switching in WDM networks,” Computer Networks, vol. 50, no. 2, pp. 149-167, February 2006.